SooFoo doesn’t only work at meal-time. It can also be a great snack! I woke up early one morning and decided it was time to get back in the saddle again. 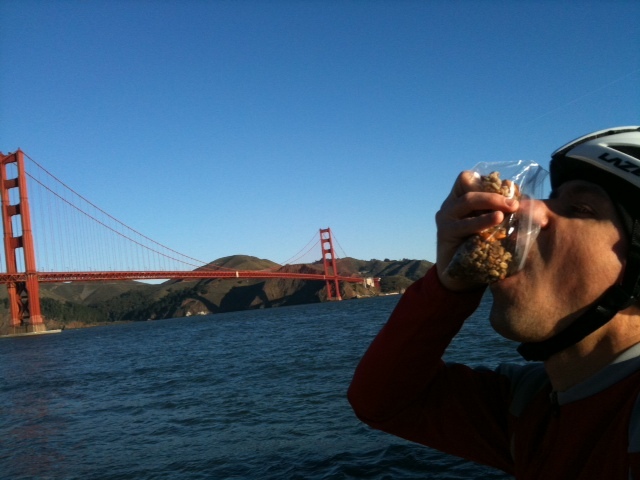 Blew some dust off the road bike, suited up (it was COLD out here), and made myself up a bag of SooFoo trail mix for the road–cold SooFoo, almonds, seeds, and dried cranberries. It’s only a few miles by bike to one of the best views you can get of the Golden Gate. Side fact, this year marks the 75th Anniversary of the bridge’s completion. This is where I stopped to fuel up on my SooFoo snack to provide much needed energy for the hills on the ride back.